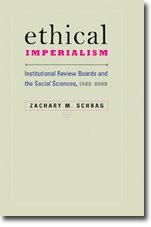 Linda Shopes, "Negotiating Institutional Review Boards"
E. Taylor Atkins, "Oral History and IRBs: An Update from the 2006 HRPP Conference"
Zachary M. Schrag, "Ethical Training for Oral Historians"
I plan to comment on the Atkins essay in a separate posting. For the Shopes piece, I offer a small factual correction: 45 CFR 46 was first promulgated in 1974, not 1981. See Final Rule, HEW, Protection of Human Subjects, Federal Register, May 30, 1974. [PDF] I am working on a history of the regulation of the social sciences as "human subjects research" from 1966 to 1991, which I hope will clear up some of this chronology.